OP, I'll have to give the Ray-O-Vac another try. I haven't used them for probably 30 years. Back then, the LED flashlights didn't exist and the incandescents were/are battery hogs. The Ray-O-Vac batteries did not do well back then. They had poor energy density and had a tendency to leak. It may be time for another look at them. I have run a comparison test between the Energizer alkaline and the Duracell alkaline batteries. I used a two AA cell incandescent flashlight. What I found was the Duracell provided steady light output right up until it grew dim and unuseable. Once that happened, the batteries were done for. The Energizer cells would grow dim and unuseable within a short time, but let them rest a bit and they were back as strong as ever. The Energizer would repeat this going dead and then rejuvenating cycle several times. So the conclusion I reached was, the battery choice depended upon how you used the load. I needed a flashlight to last for hours at a time without rest, so the Duracell was my choice at work and by default, at home. Had my needs only called for 20 or 30 minute bursts, I probably would have used the Energizer, because just like the advertising says, they keep going. But they need that little rest period between uses. I'll take your advice and give Ray-O-Vac another try. We'll see how they pan out. Why are all my flashlights or most of them, having problems with corroded battery's ? I have two I removed from the console of the work truck today, I can't get the batterys out there corroded so bad. Another was in my shoulder bag, hasn't been used since I put new batterys in, only a few months ago. Most of the batterys are duracell. whats happing here? Duracell 'copper tops' are not what they used to be, or are cracked up to be. Alkaline batteries have different chemistry than the lead-zinc batteries and will always last longer. Oh, yeah. Very rarely do we need to "quick draw" a flashlight. If you want the batteries to last virtually forever, just reverse them (+ vs -) in the flashlight. I'll bet you can take them out and turn them around in less than 60sec. Also, the biggest reason for zinc-carbon batteries leaking (next to vampiric current drain) is humidity. Swinging 40-60 degrees between night and day will create humidity inside the flashlight before it will be evident elsewhere. I've noticed that too. It seems like the devices with a little parasitic draw are worse. Those fancy flashlights with bright-dim - flash and multi-colors functions are susceptible. My driveway alarms were bad for it too. I switched over to Energizer Ultimate lithium because I needed them to work at -30*F and the alkaline quite at around -10*F. I noticed that the Lithium did not corrode. On the real expensive stuff, like my night vision equipment, I don't leave batteries in if I'm not using them. It's an inconvenience, but I don't want to buy those devices again. Try the Energizer ultimate Lithium. They cost more, but the energy density it higher (they last longer before they go dead) and they don't seem to leak. Oh, and they continue to work even when it gets really cold. If your in the high heat part of the country and your vehicle interior temps are spiking at 150*F +, I have no experience, Sorry. another thing to keep an eye on is the backup battery for your scanner and the weather radio. They typically operate on wall outlet power and the battery is there only to maintain memory in case of a power outage. If your power is reliable, it easy to forget about the backup batteries until it's to late and the battery holder assembly is ruined. I check mine every time I change the battery in the smoke detectors. I use a voltmeter and expect to see 1.45 volts or better. If I didn't have that, I would put in a fresh set and move the old batteries over to a flashlight that I know would use up the battery within the year. VERY NICE POST, marchone! I couldn't agree more. Here is another from Sarge's first batch of Ethan Becker's Colclesser Kephart copies. 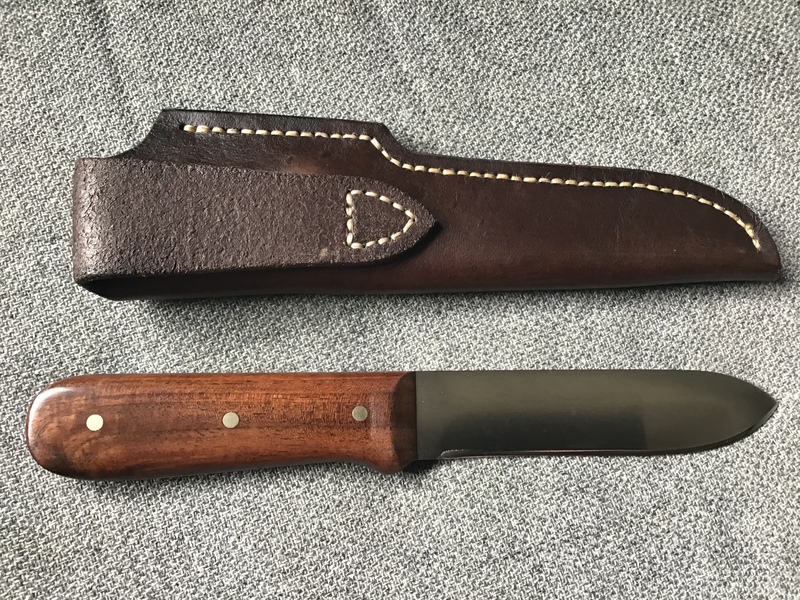 I want to thank Blades & Bushlore for access to the info I gleaned to reach out to him and order one. He has been a true pleasure to work with. He was communicative, polite, and met his stated time frame. 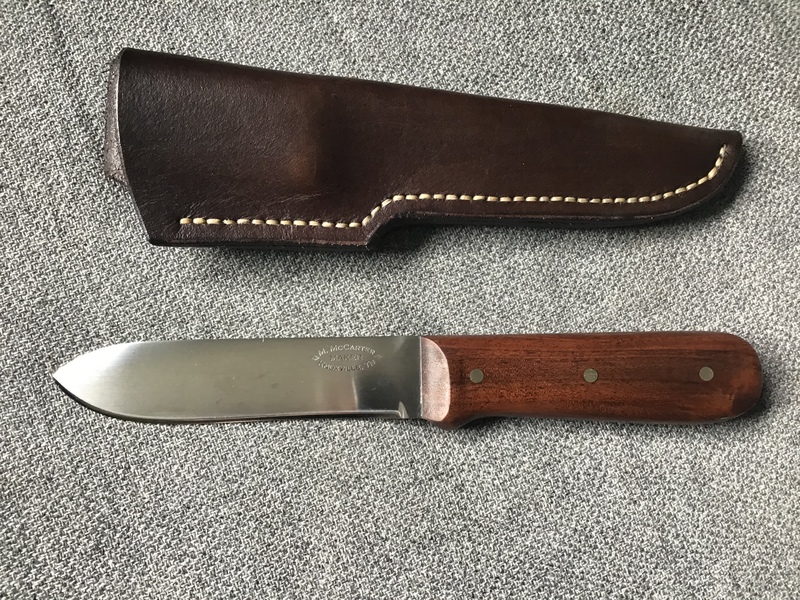 There are many Kephart inspired knives available now. Sarge's is the truest museum replica to date. The blade's double convex cross section and handle configuration follows the original better than any other. 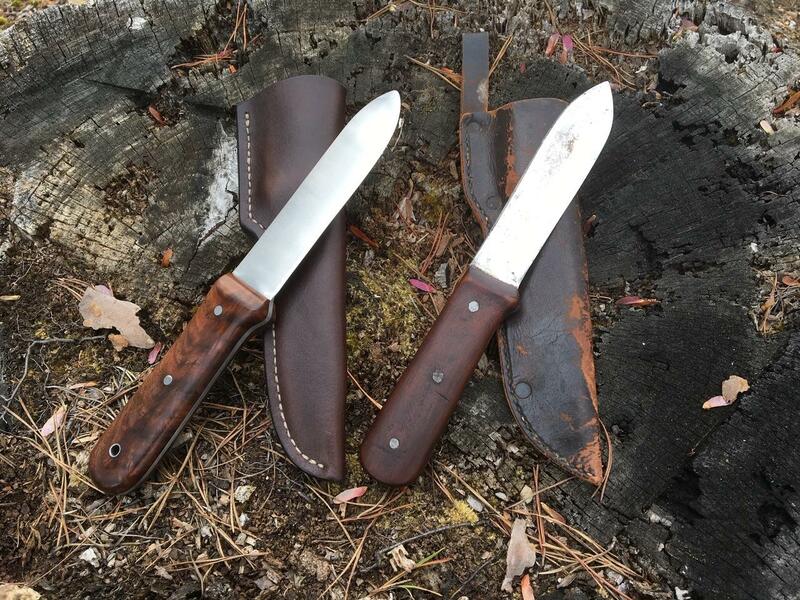 The photo below is of the Becker Colclesser knife and an early one of Sarge's series of 12 knives. Anyone following the story here will know he tweaked details until he was happy by the 5th knife. The man is a master craftsman and a dedicated scholar. I am thrilled and honored to possess one. Any Cub I ever knew would have been proud to woggle one of those knots up his kerchief! You must have been in heaven, Mike! Hope you all had a blessed and joyous Easter......it was glorious on my end!